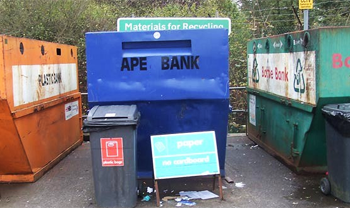 I wonder if Monkey’s have a similar sign somewhere? In any civilised country they would ensure that the terrace is fenced off from the Monkeys, but that would be too much for the country that believes it is going to be a world leader one day, all of which goes to show that the Indians are as daft as the Chinese doesn’t it? What Do The Bird And Deer Look For? 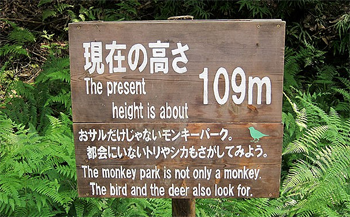 Sometimes you see a sign that really asks more questions than it answers, just like this one from the masters of misinformation and translation, the Japanese bless them. I am afraid that is all of the information I can give my dear cuddly readers I thought the Monkey Park was lovely and so did the Monkeys but I never discovered exactly what the Bird and Deer look for which is quite sad because if I had I would have been able to tell everyone in my latest masterpiece of feline literature ‘The Cat’s Travelogue’ and put some of the other pictures I took of Japan on the Cat’s Diary www-wickedlywonderfulwebsite www.thecatsdiary.com. Ok Brad and Ange (that is Brad Pitt and Angelina Jolie if you need a clue) do it so why not a Monkey? 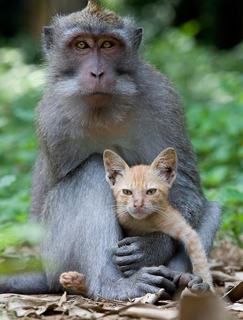 It has come to my attention that a long-tailed Macaque Monkey has been discovered looking after a Kitten in the forests of Bali and apparently is doing a better job than some humans. I have to say that if your name is Macaque you probably need all the friends you can the name sounds a bit ‘french’ if you know what I mean, that Monkey should definitely avoid standing with his hand on his hip with a name like Macaque shouldn’t he? Mind you judging from this portrait I think that the Monkey should be called Ronald he really looks like a ‘Ronald’ don’t you agree? 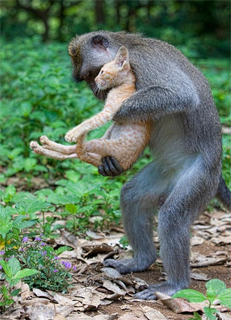 Still both Monkey and Kitten are doing well and when asked how he felt about being adopted by a Monkey the Kitten was reported to say. 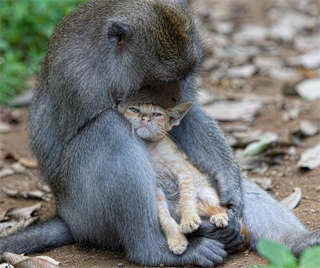 “Migle, mmh ahh, ugh!” Which suggest that the Monkey may be cuddling just a little too enthusiastically. But a little bit of tough love never hurt anyone Kittens included and compared to the thoroughly revolting woman who me and the lads ‘sorted’ recently. 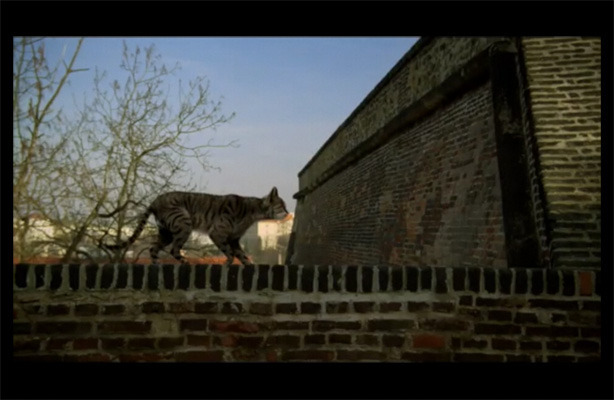 You remember dear reader the dreadful old hag who seemed to think that it was really clever, funny – well I don’t exactly know what the dreadful middle aged bag thought when she petted and then dumped a Cat in a trash container – well there is no comparison is there? Once again animals prove to be more civilised than humans, sorry I am blushing now but we really are a cut above a lot of humans aren’t we?